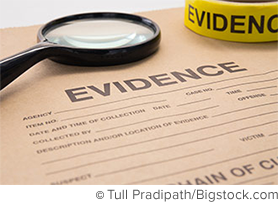 I love talking with my students about crime shows, where science and forensic evidence are often pivotal to catching criminals. I especially enjoy reminding them of scenes where characters such as Gil Grissom of CSI tell detectives to “follow the evidence” during an investigation. Such examples can be found in other media as well, including books like Debora Blum’s The Poisoners Handbook: Murder and the Birth of Forensic Medicine in Jazz Age New York. The book is filled with terrific forensic stories to share with students. 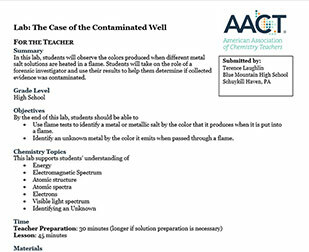 In the spirit of these shows and stories, this article shares my attempts to improve student engagement through the use of forensic scenarios linked to tried-and-true chemistry labs. Local commissioners decided it was time for the county to have its own Crime Investigative Service. Since you are a highly decorated chemistry student in high school, you have been hired to start this new crime fighting division. On your first day on the job, you get a call from an elderly woman with a complaint against the “lousy, good-for-nothin’ teenagers who lived next door.” She reports that these kids contaminated her well with some type of liquid. “I saw them do it! They put something in there and now I am afraid to drink my water!” You decide to take a sample of her well water for analysis. While interviewing the accused, you notice an unmarked container of water sitting on the workbench of the garage. Possibly, this contained the liquid that was added to the well. To be sure, you collect a sample to compare to the well sample. Fortunately, you remember a procedure that you conducted in chemistry class, called a flame test. It is a way to identify certain metal ions in a solution. You create a series of known solutions with possible contaminants and test them against both the garage sample and the neighbor’s well. In my scenario, I include two new stations, one labeled “well” and another “garage,” which are used to decide the outcome of the case. Using distilled water for the “well” sample and a sodium solution for the “garage” would suggest that the misguided youth had nothing to do with the well because they do not match in color. But sometimes I use a sodium salt solution for both the “well” sample and the “garage” sample, suggesting that the students are the sort who like to get into mischief, and did contaminate the well. The situation could be switched up from the morning to afternoon, so that students from different classes can’t share results. Police are in search of a hit-and-run suspect who crashed into the front security gate at Xavier’s School for Gifted Youngsters. No one was injured when a vehicle hit the main entrance gate, causing it to collapse. “I suspect that this is the work of my nemesis, Magneto,” claims Professor Xavier, director of the school. “He has been trying to disrupt the education at this school for some time now.” After viewing video surveillance, police were able to determine that the vehicle was a mid-size car, but could not determine the make or model. Metal pieces left from the crime scene are being analyzed by a separate crime lab and will help police determine which car may have been involved in the accident. The police have three suspects, who each own a mid-size car with damage to the right front fender. Suspect 2 Tyler Maine’s (aka Sabertooth) employment records show that he is working for Magneto. An abandoned car, registered under his name, was discovered by police outside the tiger section of the city zoo. The car had damage that is consistent with crashing into a gate. Because you are such a great chemistry student, you realize that every type of metal has a unique ability to conduct heat. Therefore, you can determine the specific heat of the metal from each suspect’s car and compare it with the results found with the metal collected at the gate. The lab groups analyze metal collected from each suspect’s car. I like to use aluminum, nickel, and zinc because they have similar colors but very different specific heat values. As the students finish reading about the last suspect, I write the accepted specific heat value of one of the metals on the board and explain to the students that this is the specific heat of the metal that was found at the crime scene. If the students do the lab correctly, their results should closely match the value of one of the suspects. Always looking for new labs and techniques to include in my course, I discovered a program called Science in Motion (SIM) that provided me an opportunity to develop a unique lab experience for my students. Made up of a consortium of 12 colleges and universities, the SIM program gives both middle and high school science teachers an invaluable opportunity to borrow laboratory equipment and conduct more than 50 labs with their students. For this case, I reserve equipment to conduct five labs that are offered by the program: GC Analysis of Mouthwash, HPLC Determination of Caffeine in Soda, IR of a Solid, UV Analysis of Suntan Lotion, and Melting Point of a White Powder. Administration suspects that a disgruntled teacher had caused the vandalism. The statue was covered with suntan lotion, mouthwash, and soda. Upon closer examination, small white fibers and traces of an unknown white powder were also collected at the crime scene. The evidence was sealed in appropriate containers and sent off to the chemistry lab for analysis. Using surveillance cameras, the principal was able to identify six suspects who were present at the statue, but could not determine if they committed the crime. The suspects were: the math, history, English, and phys ed teachers, along with the guidance counselor and disciplinarian. When brought in for questioning, each suspect was found to have soda, mouthwash, and suntan lotion and a mysterious white powder in their possession. A sample of each suspect’s clothing was collected to be compared to the fibers found at the crime scene. The white powders associated with each teacher were also checked. Each teacher was also found to have white substance on them. The phys ed teacher had athlete’s foot powder inside a locker. The English teacher was seen eating powdered sugar doughnuts in the cafeteria on the day of the crime. The history teacher had a food preservative in his lunchbox. The math teacher had Tylenol, or acetaminophen, in the top drawer of his classroom desk. Traces of aspirin were found in the disciplinarian’s office. The guidance counselor is known to frequent a local diner in the morning, consuming a cappuccino with three packets of NutraSweet. NutraSweet packets were also discovered in the coat pocket of the counselor. All samples for this test are prepared in advance by the SIM program and are ready to use by the students. To prepare the samples, a small quantity of suntan lotion with a high SPF value is dissolved in isopropanol. When analyzed, these samples will show absorption values around 300 nm (UV wavelength), while samples without the lotion will not show a peak (Figure 1). Figure 1. Comparison of Absorption Peaks with a UV/VIS Spectrophotometer. The teacher known as “Suspect 1” has an absorption peak (~0.9) which did not match that found at the “crime scene,” while that of the teacher known as “Suspect 2” did match. When students are finished with the analysis, they share them by posting the results on the classroom wall. Students in the other classes can compare results. For this analysis, students analyze the mouthwash from each suspect and the crime scene for alcohol content. Mouthwash brands that contain ethyl alcohol and those that are alcohol-free can be used for this analysis. The GC is configured to analyze for the ethyl alcohol using ambient air as a carrier gas. Samples that contain alcohol will have a peak at a retention time of approximately 2.0 minutes (Figure 2). Figure 2. Analysis of Mouthwash using Gas Chromatography. The first teacher, known as Suspect 1, has mouthwash that contains alcohol, as shown by a retention peak at 2 minutes. The crime scene also has peak at the same time. The second teacher, known as Suspect 2, does not have a peak, indicating no alcohol was found in the mouthwash. As with the UV/VIS analysis performed the previous day, students post the findings on the classroom wall for comparison. As a side note, though our partnering university provides a different model GC, I’ve also conducted this experiment using Vernier’s Mini GC with much success. Similar to gas chromatography, students use HPLC to determine if caffeine was found in the soda samples collected from each suspect and the crime scene. An advantage to using the SIM program is that all samples are prepared and ready to use. Preparation for these samples involves heating both caffeinated and decaffeinated soda samples (to remove carbon dioxide) and diluting the solutions to prevent clogging the column. When the students analyze the soda samples, those that contain caffeine will show a peak at a retention time of about 2.3 minutes, while samples that are decaffeinated will not show a peak (Figure 3). Figure 3. 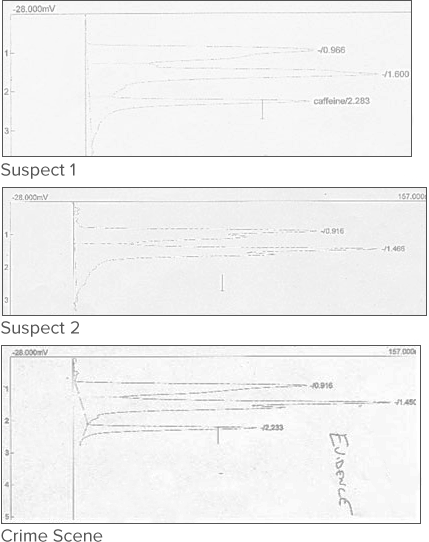 Analysis for Caffeine in Soda using HPLC. For suspect 1, observation of a peak at the ~2.3-minute retention time shows the soda sample contained caffeine, which matches that of the crime scene. For Suspect 2, no peak was observed at the retention time of ~2.3 minutes, indicating the soda sample did not contain caffeine. In this lab, students analyze the clothing fibers collected from each teacher and compare them to samples from the crime scene. Students analyze samples for % transmittance peaks that appear at specific wavenumbers. Students then compare the data collected by analyzing the fibers collected from each suspect with the sample found at the crime scene. Strands of nylon, cotton, and polyester work well for this analysis, because they each show unique wavenumbers (Figure 4). Figure 4. 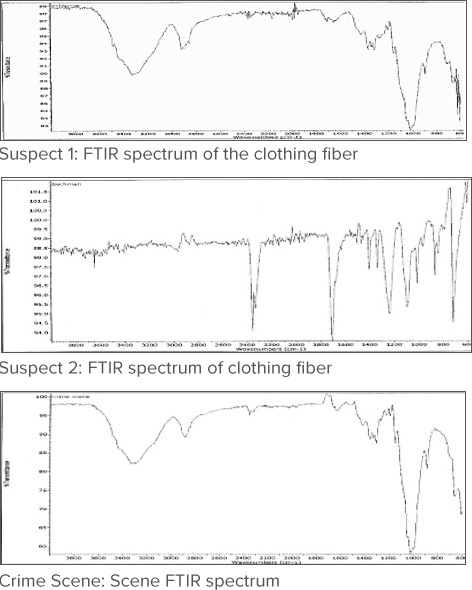 Analysis of Clothing Fibers using FTIR. The analysis of the fiber collected from the first suspect has a wide peak at wavenumber 3300 and short peaks at 2900 and 1000, matching the fiber collected at the crime scene. The second suspect has a completely different wavenumber pattern that does not match the fiber collected from the crime scene. At the end of day 4 of the Vandalism of the Eagle Statue case, I recommend that students make a chart listing all the results that have been collected. The following chart helps students visually determine which teachers matched the evidence for each test conducted (Figure 5). Figure 5. Summary of Analysis Chart. Before the last lab session, students summarize the results by creating a table of the results. The results suggest that the evidence collected from teacher 2 and 6 match the crime scene for each analysis. These two teachers should be considered the main suspects for the crime. This final test requires students to analyze the melting point of the white powder found on each suspect and the crime scene. To conduct the lab, students are given small vials that contain the white powder, labeled with each suspect’s name. The powder is collected in the open side of a capillary tube and then dropped in a glass tube so that the powder is compacted on the closed side. The sample is then heated with a Mel-Temp device, which can be monitored with a thermometer. Students record the temperature at the time the powder begins a phase change to a liquid. An example of the results is shown in Figure 6. Figure 6. Melting Point Analysis of the White Powder. Students analyze the melting point of the white powder from each suspect and the crime scene. Teacher 6 is the only one who matches the evidence collected at the crime scene. When the final melting point test is completed, students should to be able to determine who was responsible for the crime. They are required to complete a formal report summarizing the case for the “District Attorney.” Though criteria for a formal laboratory may vary by the instructor, I include four general sections: (1) Introduction to the case, (2) A description of the procedures, (3) Data analysis and (4) Conclusion of each analysis and a conclusion for the case. The data collected can be electronically scanned and posted on a Wikipage or shared in a Google Drive folder for students to access and share in their written formal reports. Terence Laughlin earned his BSED in Chemistry from West Chester University of Pennsylvania and a MED from Wilkes University in Classroom Technology. He currently teaches Chemistry and STEM at Blue Mountain High School in Schuylkill Haven, Pennsylvania. During the summer, he instructs chemistry, forensics, cybersecurity, and video game design student camps at Penn State University Berks campus. When not teaching, he enjoys playing with a local classic rock band.